Last week, Karen O of the Yeah Yeah Yeahs released a full-length collaboration with Danger Mouse titled Lux Prima. The duo took the stage on last night’s episode of The Late Show With Stephen Colbert, where they performed a highly choreographed “live music video” for their song “Woman,” directed by Spike Jonze. Shot in high-contrast black and white, the video plays out as a single take without cuts between different cameras. Beanie Feldstein is among the featured dancers, and Stephen Colbert makes a cameo midway through the performance as part of an audience participation segment. Feldstein is great, though Colbert’s presence feels out of place, injecting a bit of strange comedy into an otherwise pitch-perfect video. 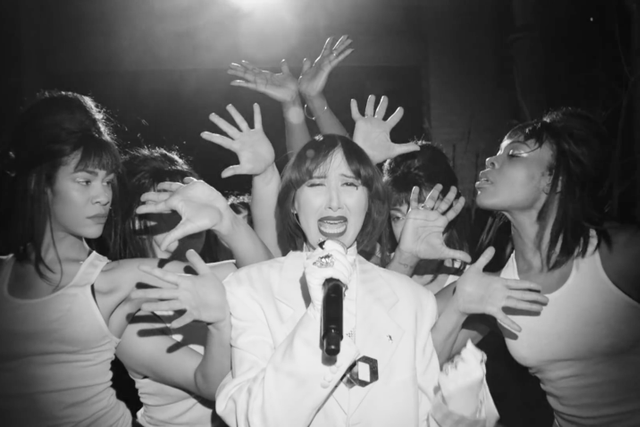 Karen O and Spike Jonze are frequent collaborators, having worked together on Where the Wild Things Are and Her, as well as past music videos. The release of Lux Prima last Friday followed two singles, “Woman” and “Turn the Light.” Said Karen O of the collaboration,”When you create from a blurry place you can go places further than you’ve ever been. I think we both were excited to go far out.” Watch Spike Jonze’s video for “Woman” below.